If you haven’t heard of Panama Papers, get ready to lose most of your faith in tons of global leaders across the world. The actual Panama Papers are a leak of 11.5 MILLION documents from a Panamanian law firm called Mossack Fonseca, which happens to be the fourth biggest offshore law firm in the world. The documents were obtained by a German newspaper called “Süddeutsche Zeitung” which were then shared with the International consortium of Investigative Journalists who then shared it with even more news outlets. The Guardian’s article, titled “What are the Panama Papers? A guide to hsitory’s biggest data leak” goes through, as simply as you can about a 11.5 million data leak to show what is and who are involved in this data leak. The Guardian shows us that this data leak is so important because it revealed that 143 politicians, which include 12 leaders of countries have used Mossack Fonseca to hide money and evade taxes, including Russian President Vladimir Putin whose now been caught hiding two billion dollars. The article does a good job of answering general questions such as what countries are most involved, Russia and China topping the list, what an offshore company is and what it does and how Mossack Fonseca acted as the registered agent of 200,000 companies. 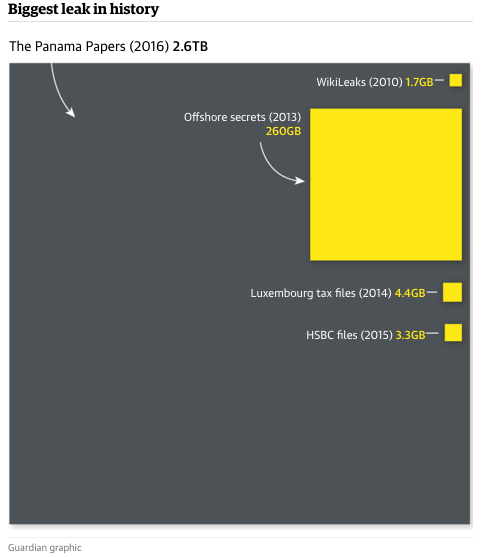 The panama papers leak is a tremendously scandalous but great thing that will hopefully bring to light the intense corruption and abuse of power by politicans across the world and will hopefully cause for people to demand increased transparency and possibly legislation preventing this type of scandal from reoccurring. Those involved in the scandal whether they were hiding money or paying for their money to be hid are not globally responsible and incredibly unethical which relates to our class in discussions of how businesses and people should act in a way the benefits as many people as possible.